It’s true what they say about the thrill of the hunt! I have so enjoyed decorating our lake house. I admit that I have gone a bit overboard (haha) with the nautical theme, but I can’t help myself! Most of our lake house decor has come from eBay or antique stores and most of these things could fit comfortable in a beach house or condo as well! Vintage boat cleats-You can buy these on eBay or new. These happened to come from the original boathouse on our property. We sold the old boathouse (to a movie studio who then used it in the movie “Careful What You Wish For”) but took off the old cleats for sentimental purposes. Plus, I think the newer cleats are made of plastic. We then used some as cleats for our wooden blinds in our family room. I love how they look! We also used a few in the outdoor shower to hold towels and swim suits. My husband caught this fish the year we bought the lake house. Talk about perfect timing! He caught the fish in Key West and they tagged, measured and photographed the fish and threw him back. This fish is a replica. I love that because the real fish is still swimming around Florida none the wiser he could have been a trophy on someone’s wall! 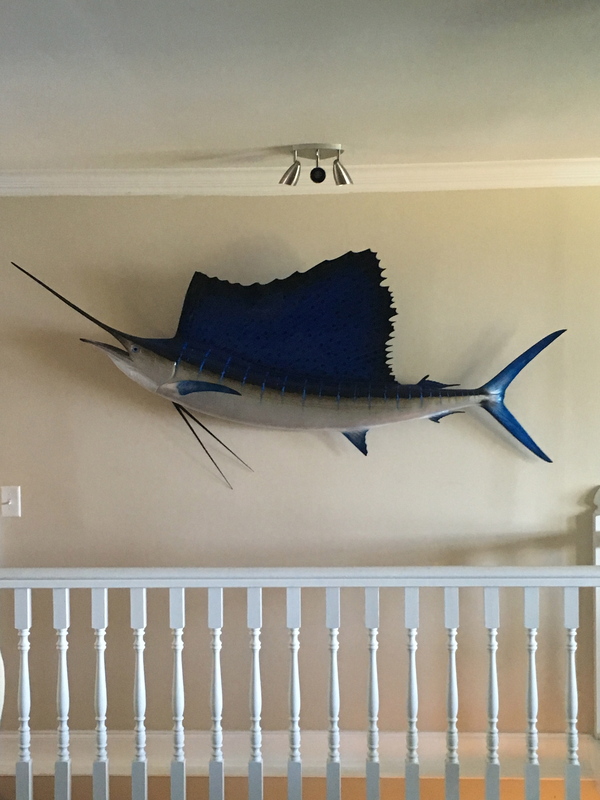 I’ve seen several different shapes and sizes of mounted fish for a fraction of the cost and some are even painted. I’m keeping an eye out for a small mounted bass for the Bunk House. You can use a lone ski in decorating too! Just add some hooks and letters. This one hangs in my younger son’s room at the lake. Handy for hanging hats, clothes, towels, etc. and keeping things off of the floor. (It would be cute with a child’s name on it too.) I also have a set of vintage wooden skis that I have propped up in the den just for decoration. They probably still work, but I love how they look and don’t want to chance it. I bought these old metal chairs and table a few years ago. They were in good shape but the cushions were rotten. I took them to my upholsterer along with a few yards of this cute coy fish fabric and he made new cushions for me. I like the bright blue and white and the fact it is Sunbrella fabric so it withstands the weather and sun. They look cute on our lake veranda and are so comfortable! This is our favorite spot to sit and watch a summer storm. We found this large wood ship or captain’s wheel at a consignment store. It looks fun and masculine in the basement/man cave. My son found this cute little clock and bought it for me. I love the shape of it and the metal sails. It is electric but honestly I don’t know if it works or not. I just love the look of it! We have it on the mantle in the basement. We used a vintage wood paddle as a handle for our outdoor shower. We painted it white and my husband used a small piece of pvc pipe behind the paddle so it would stand out from the door a little in order for it to be functional as a door pull. I love it! These are a few of my favorite nautical accents. They look right at home with my fisherman lamp collection as well as the nautical ceiling lights. I love the fun and funky lake house decor. It is so different than our other house which is probably why I love it so!